A total of 11 Israeli projects were signed at the park's opening ceremony, representing the first set of enterprises to set up operations there. Israeli chemist and Nobel Prize winner Arieh Warshel reached an agreement with the Chongqing Institute of Green and Intelligent Technology of the Chinese Academy of Sciences to establish a Nobel Prize workstation named after him in the Liangjiang New Area. The workstation will carry out cooperation in fields such as structural biology and high-throughput biological information. Born in Israel, Arieh Warshel has worked in laboratories at both Harvard and Cambridge universities. He was mainly engaged in research on molecular biology. In 2013, he won the Nobel Prize in Chemistry for designing multi-scale models for complex chemical systems. In August 2018, the management committee of Liangjiang New Area, Zhongguancun Medical Engineering and Transformation Platform (Chongqing) and Israel's ShaySapir Investment Management Co signed a cooperation agreement in Israel. They decided to work together to build the China-Israel Industrial Park and bring Israel's high-quality medical resources and advanced medical technology to China. The parties also agreed to establish a China-Israel bio-pharmaceutical investment fund of 2 billion yuan ($295 million) to help improve Chongqing's medical industrial chain and build a medical innovation system. According to the cooperation agreement, up to 50 projects or enterprises will be introduced to the park every year. Meanwhile, two China-Israel innovation competitions will be held every year in Chongqing. Relying on Chongqing's industrial strength and advantageous location, the industrial park will focus on the development of the health industry, high-end technology such as artificial intelligence, new materials, new energy and communication systems, and try to attract investment from innovative and technologically advanced enterprises from Israel. 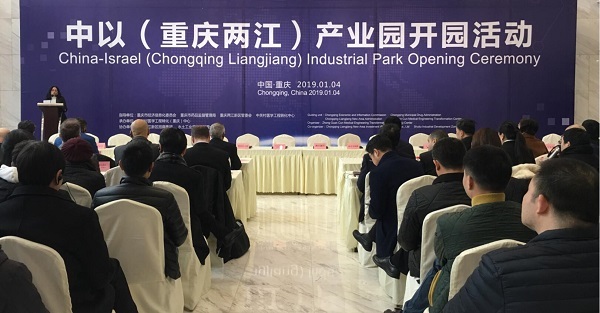 The new park aims to become a leading international high-tech and environmentally friendly park, as well as a gathering place for high-tech domestic and foreign enterprises in western China. In addition, 19 domestic health industry projects will be signed with the Zhongguancun Medical Engineering and Transformation Platform (Chongqing). Nine of the projects involve the smart medical and digital medical industries, delving into new fields such as precision medicine and health management.